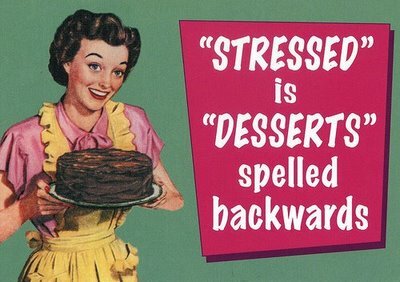 Ever gotten to that 3:00 pm point in your work day (or 9:30 am … or 11:00 am … or 2:00 pm … we’re not picky here at GKG with our noshiness) and felt like this? Ever gotten home itching for dinner … only to see that it’s 8:30, nothing’s cooked, and your stack of takeout menus looks awfully appealing? We’ve all been there! And while I’m a big advocate for meal planning when you grocery shop to avoid these kinds of “Egads! What the heck can I eat? ?” moments, time crunches, schedule shifts and last-minute snafus are inevitable. Who knows when you’ll have to stay late at the office, attend a last minute meeting, or hit traffic on your way home? 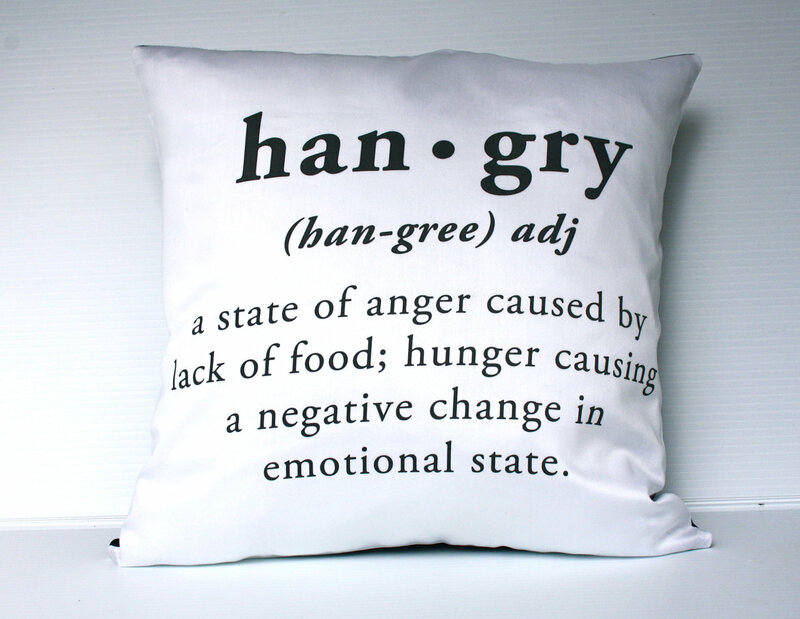 And with a growling stomach, it’s a wonder we don’t have an epidemic of hangry* Americans on our hands. Image sourced from etsy.com. Yup, that’s me at about 5 pm every day. For these nights, I’ve whipped up this list of 5 Quick Meals for Busy Weeknights. Don’t worry, they aren’t just PB & J (well, one of them is — with a twist! 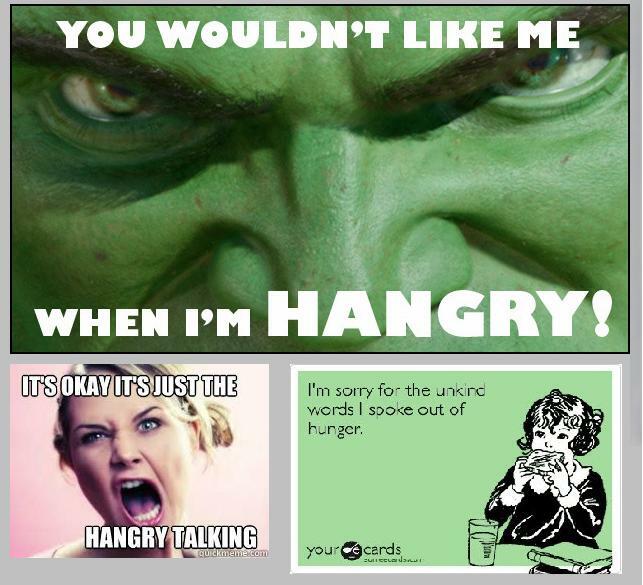 ); instead, they’re hearty, healthy meals that you can put together in about 10 minutes flat. Wallet-friendly, healthy food in less time than it takes to wash your hair. Win. Tex-Mex Egg Scramble: Spray a microwave-safe cereal bowl with Pam or other cooking spray. Crack two eggs into the bowl, mixing lightly with a fork. Add 1 tsp of salsa, a sprinkle of chili powder, and a dash of garlic salt. Microwave in 40-second spurts until mostly cooked through. Scramble again with the fork and microwave for one final 20-30 second stretch. Serve over salad greens with a sprinkling of Mexican-blend cheese. Deluxe ABJ: Toast two slices of whole-grain bread. Spread one slice with 1-2 tbsp almond butter. Spread the other slice with 1 tsp peach or strawberry jam. Sprinkle the almund butter slice with ground flax seed meal, and slice 1 banana to add to the sandwich. Spicy Tuna Wrap: In a small bowl, mix 1 drained can of albacore tuna with 1-2 tbsp mayonnaise, a dash (to taste!) of Sriracha chile sauce, a dash of garlic salt, a dash of ground black pepper, and 1/2 tsp parsley. On a whole grain wrap, spread tuna mixture; top with chopped tomatoes and cucumbers. Add a slice of cheddar or Swiss cheese (optional). Roll into a wrap or burrito as you prefer. Quesa-Quicka: On a whole grain tortilla, sprinkle 1/4 cup Mexican blend cheese. Add 1/2 cup drained and rinsed black beans. Mash the beans slightly with a fork. Top with 1-2 tbsp salsa of your choice, chopped tomatoes (optional), and 1/2 a chopped jalapeno (also optional!). Fold in half. Toast under a preheated 500° F broiler for 5 minutes, or until tortilla is brown and cheese has melted, flipping once. Cut into wedges and serve with salsa and sour cream. Microwave Croque Monsieur: Toast a piece of whole grain bread. While the bread is toasting, set aside a slice of Swiss cheese. Spray a microwave-safe bown with cooking spray. Add 1 tsp water and 1 whole egg. Cover with Saran wrap or other plastic wrap. Microwave in 30-second spurts until the egg appears cooked to your liking. Place slice of Swiss cheese on toast; top with fried egg. Season with salt, pepper, and a drizzle of Sesame oil for an Asian twist on a classic French sandwich. The possibilities for quick meals are pretty much endless, but these are among my favorites when I’m feeling like a hungry-hungry-hippo at the end of a work day. What are your quick and easy go-to meals for busy weeknights? If you folks are vegan (i.e. no tuna, cheese or eggs, as I make liberal use of in these recipes), what are your solutions for quick meals? Happy eating!